“For every 100 extremely low-income (ELI) renter households in the country, there are only 29 affordable and available rental units,” the Urban Institute states. 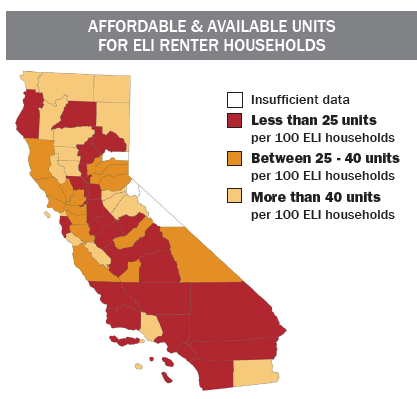 “As defined by the Department of Housing and Urban Development (HUD), extremely low-income households earn 30% or less of area median income.” In Ventura County, the number of affordable and available rental units is even lower, estimated at just 20 per 100 ELI households. In Ventura County, the Fair Market Rent (FMR) for a two-bedroom apartment is $1,479. 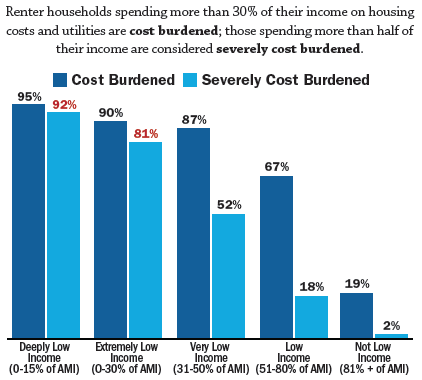 In order to afford this level of rent and utilities – without paying more than 30% of income on housing – a household must earn $59,160 annually. Assuming 40-hour work week, 52 weeks per year, this level of income translates into an hourly wage of $28.44. In California, a minimum wage worker earns an hourly wage of $9.00. In order to afford the FMR for a two bedroom apartment in Ventura County, a minimum wage earner must work 142 hours per week, 52 weeks per year. Or a household must include 3.6 minimum wage earners working 40 hours per week year-round in order to make the two-bedroom Fair Market Rent affordable. This data points out the clear and immediate need for the Hope Foundation’s services, which will provide access to new affordable housing in Ventura County, reducing the strain felt by many low-income residents of the area and giving families struggling with homelessness a new lease on life.